In front of their home crowd at the Mattamy Athletic Centre (MAC) the Ryerson men’s basketball team defeated the Carleton Ravens 73-68 to capture their first OUA championship and second banner, since defeating Carleton in 1999 to claim the OUA east division title. 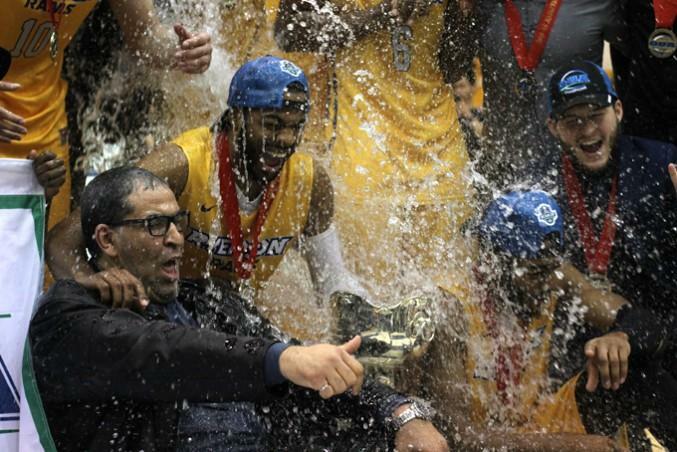 After fans rushed the floor to celebrate with the players, champagne had been popped onto the court and the OUA trophy had been soaked in water, a smiling Aaron Best voiced his thoughts on the culmination of the last five years for the Ryerson men’s basketball program. “It’s huge because it’s a testament to the work that everybody put in, not just everyone on this team but everyone who has played for this team since the beginning,” said Best, while draped in the OUA championship banner. Best, in his last career game on home court, finished with a game-high 21 points, along with five rebounds and one steal. At half, the Rams found themselves down 40-27. Two of Ryerson’s strengths had been hurting them the most. They struggled from three-point range (4-14) and instead of running the floor in the unprecedented fashion that has become the norm this season, they frequently turned the ball over. Heading into the second half, it was clear that big adjustments would have to be made in order for the Rams to overcome the 13-point deficit. “I put it solely on Kadeem [Green] and Aaron [Best] at half time,” said head coach Patrick Tatham. “I said, ‘It’s your last game here on this court, ever. Don’t go out as losers, be a winner.’ And Kadeem and Aaron really picked up in the second half,” he added. As the second half rolled on, it was clear that Tatham’s words were not taken lightly. The Rams came out firing on all cylinders and eventually cut down the Ravens lead, leaving the game tied at 55 heading into the third quarter. As the final minutes of the fourth quarter trickled down, the Ravens and Rams traded baskets. JV Mukama walked toward the free throw line after being fouled and calmly knocked down a foul shot to make it a four-point game. That sealed it for Ryerson, who emerged victorious. “At one point I felt my skin trembling because the crowd was so loud. I think that pushed the guys over the top once we tied it at 55. Once we got that it was all downhill from there. We were just rolling.” said Tatham. On the defensive end, it was once again Kadeem Green who shined. He finished with six blocks and eight rebounds, while adding seven points. Mukama finished with 11 points, while Adika Peter-McNeilly had 16. Ryerson now moves on to the CIS Final 8, which takes place next weekend at the University of British Columbia, where they look to improve on last year’s bronze medal finish – this time, as a possible one seed.